"I guess I expected an Africa that you see on TV. Once you get there you find that everyone is as individual as in the west, but so much more open to ideas, and you start to see your own way of seeing things as narrow. Once you have an open mind, everything fits into place." Most volunteers fly into Ghana in the evening, and the first thing that will hit you is the humidity. You'll walk across the tarmac to the arrivals building, and pass through immigration control to the baggage reclaim area. Once you have your luggage, you need to go through customs, and be ready to have your bags opened by security staff as this is done routinely even when you go through the "nothing to declare" channel. As you walk out of the airport building you will be met by a wall of people on the other side of a barrier, waving meeting signs. One of our staff will be there to meet you with a Projects Abroad sign, and will greet you with your full name (do not go with anyone who cannot tell you your name). If your placement is in Accra, you will be taken from the airport straight to your host family. If you are going to a placement away from the city, you will first be taken to the house of our Director, Tom Davis, and his wife Julie, where you will spend your first night. 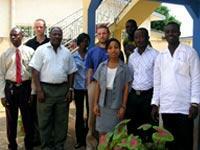 Our staff in Ghana know all our host families very well and in most cases have done so for years. While levels of comfort in these houses do vary, we monitor families regularly to ensure that every host meets our required standards for such things as security, cleanliness and availability of water. The day after your arrival, you will be met at your accommodation by one of our local staff. If you are based in Accra, you will spend the day getting a comprehensive induction, showing you how to get around the city, where to e-mail, what to do if you get sick and so on, and incorporating a traditional Ghanaian lunch. If you are based in the Akuapem Hills, Cape Coast, Ho or Kumasi, you will be taken by a member of staff to your project area and given the full induction either that afternoon or the following day. A member of staff will also take you to be introduced at your placement before you start work. Some volunteers walk to work, others take a shared taxi or mini-bus known as a tro-tro. Our staff will make sure that you know how to do this journey. Please note that if you do need to use local transport to get to and from work you will need to cover the cost, which should not be more than 50p per day on average. We have five Regional Offices in Ghana - Accra, Cape Coast, Ho, Kumasi and the Akuapem Hills, meaning our field staff are never far away, wherever your project is. Your primary contact is the Regional Co-ordinator for your area, who is the full-time member of our local staff, trained by us, with a detailed knowledge of all the projects and host families in his or her region. They are available 24 hours a day by phone if you have any questions or problems. "I had a wonderful time with the other volunteers - especially travelling. If you wanted to do something there was always something going on." In Accra or Kumasi you can visit the bustling African markets selling everything from shoes and batteries to traditional cloth and carvings. Then a tailor in the street will transform your wood-cut prints into skirts and shirts for a couple of pounds. You can relax on some great palm-lined beaches along the coast, watch monkeys in Kakum Rainforest Reserve near Cape Coast and go mountain biking in the Akuapem Hills. If you want to party, Accra and Kumasi have lots of bars, clubs and restaurants - none of our volunteers ever fails to have a good social life here. At the weekends, you can get together and travel to places such as Ada in the Volta Delta or Kakum National Park. During your weeks off you may think about travelling to Mole National Park to see elephants close up and on foot, or get some more stamps in your passport by visiting Benin or Burkina Faso - and some even make it as far as Timbuktu!